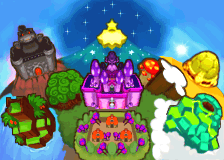 Thwomp Volcano is a currently inactive volcano in the southeast corner of the Mushroom Kingdom. The Mario Bros. come here in pursuit of Bowser (who has kidnapped Princess Shroob disguised as Princess Peach) during the events of Mario & Luigi: Partners in Time. 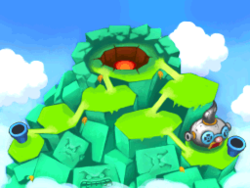 The younger version of Professor Elvin Gadd used to live here prior to its annual eruption. The interior of the volcano, Thwomp Caverns, can be accessed by using Mr. Thwomp as an elevator, and deep inside the caverns, Bowser and Baby Bowser are fought. After the Hydrogush 4000 renders the volcano inactive, the adult and baby bros journey inside after being confronted by Mr. Thwomp and Mrs. Thwomp. Mrs. Thwomp becomes outraged that the volcano became inactive and her husband loses his confidence. After the battle with Mrs. Thwomp, Mr. Thwomp agrees to help the Mario Bros. get a lift inside. Super Mushroom Four are in the ? Block in the west of the sixth scene in the second area. Three are in the ? Block in the lower cave in the third scene in the third area. Ultra Mushroom In the ? Block inside the stores in the second scene of the first area. Ultra Drop Two are in the green block in the second-floor area of the third scene in the first area. In the green block in the second-floor area in the sixth scene in the second area. In the green block above the lowest cloud behind the second scene in the third area. 1-Up Mushroom Two are in the ? Block in the west of the second scene in the third area. 1-Up Super In the green block on the lower west cloud in the inner area of the fifth scene in the second area. Red Pepper Two are in the ? Block in the fourth scene in the second area. Green Shell Two are in the left ? Block in the highest area of the sixth scene in the second area. Three are in the ? Block in the fifth scene in the third area. Bro Flower Three are in the ? Block in the northeast of the third scene in the third area. Cannonballer Three are in the ? Block in the northeast of the second scene in the second area. Ice Flower Three are in the ? Block in the first-floor area of the third scene in the first area. Three are in the ? Block in the east of the fourth scene in the first area. Three are in the ? Block in the southeast in the sixth scene in the second area. Three are in the ? Block in the northwest of the third scene in the third area. Two are in the ? Block in the northwest of the sixth scene in the third area. Trampoline Two are in the left ? Block on the first-floor slope in the third scene in the first area. Counter Badge In the ? Block on the west second-floor platform in the fourth scene in the second area. Block Trousers In the red block to the right of the third-floor area of the sixth scene in the second area. Bean In the southwest of the second scene in the first area. In the west platform in the fourth scene in the first area. In the northeast ledge in the fifth scene in the first area. In the east platform in the second scene in the second area. In the southwest of the second scene in the second area. In the high platform in the north of the third scene in the second area. In the middle second-floor platform in the fourth scene in the second area. In the west second-floor platform in the fourth scene in the second area. In the middle of the third-floor platform in the fourth scene in the second area. In the wets of the third-floor platform in the fourth scene in the second area. In the southeast platform in the sixth scene in the second area. In the right platform in the second-floor area in the sixth scene in the second area. In the floating platform in the first scene of the third area. In the east cave in the second scene in the third area. In the cave in the west of the fifth scene in the third area. When Bowser and Baby Bowser get shot out of the volcano, they are going up. When Bowser is falling down, the scenery is still going up even though Bowser is falling. This page was last edited on March 24, 2019, at 15:03.